This sample enables you to run some Go code in an AWS Cloud9 development environment. Creating this sample might result in charges to your AWS account. These include possible charges for services such as Amazon EC2 and Amazon S3. For more information, see Amazon EC2 Pricing and Amazon S3 Pricing. Before you use this sample, be sure to meet the following requirements. You must have an existing AWS Cloud9 EC2 development environment. This sample assumes you already have an EC2 environment that is connected to an Amazon EC2 instance running Amazon Linux or Ubuntu Server. If you have a different type of environment or operating system, you might need to adapt this sample's instructions to set up related tools. See Creating an Environment in AWS Cloud9 for details. You have the AWS Cloud9 IDE for the existing environment already open. When you open an environment, AWS Cloud9 opens the IDE for that environment in your web browser. See Opening an Environment in AWS Cloud9 for details. In this step, you install and configure Go, which is required to run this sample. In a terminal session in the AWS Cloud9 IDE, confirm whether Go is already installed by running the go version command. (To start a new terminal session, on the menu bar, choose Window, New Terminal.) If successful, the output should contain the Go version number. Otherwise, an error message should be output. If Go is installed, skip ahead to Step 2: Add Code. Run the yum update for (Amazon Linux) or apt update for (Ubuntu Server) command to help ensure the latest security updates and bug fixes are installed. To install Go, run these commands, one at a time. rm ./go1.9.3.linux-amd64.tar.gz                                       # Delete the installer. The preceding commands assume the latest stable version of Go at the time this topic was written. For more information, see Downloads on The Go Programming Language website. Add the path to the Go binary to your PATH environment variable, like this. Open your shell profile file (for example, ~/.bashrc) for editing. At the end of this line of code, type the following, so that the code now looks like this. Source the ~/.bashrc file so that the terminal can now find the Go binary you just referenced. Confirm that Go is now successfully installed and configured by running the go version command. If successful, the output contains the Go version number. In the AWS Cloud9 IDE, on the menu bar, choose Run, Run Configurations, New Run Configuration. On the [New] - Idle tab, choose Runner: Auto, and then choose Go. 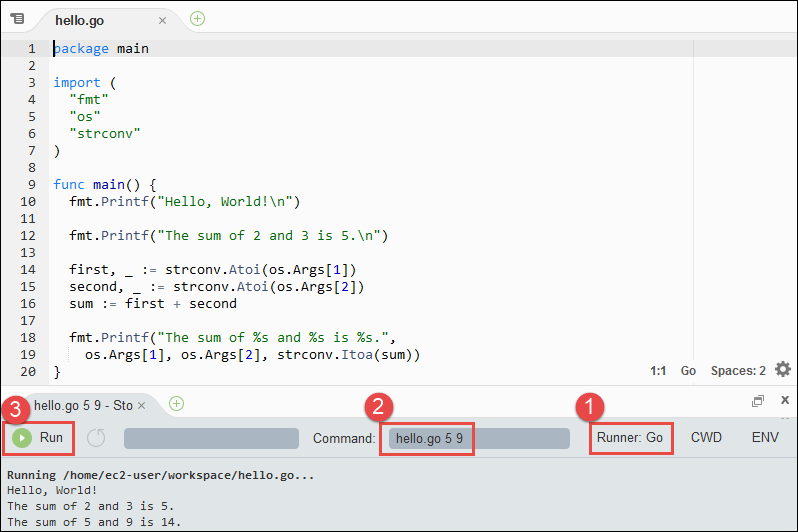 If Go is not available, you can create a custom runner for Go. On the [New] - Idle tab, choose Runner: Auto, and then choose New Runner. On the My Runner.run tab, replace the tab's contents with this code. Choose File, Save As on the menu bar, and save the file as Go.run in the /.c9/runners folder. Choose the hello.go tab to make it active. For Command, type hello.go 5 9. In the code, 5 represents os.Args, and 9 represents os.Args. Choose the Run button, and compare your output. You can enhance this sample to use the AWS SDK for Go to create an Amazon S3 bucket, list your available buckets, and then delete the bucket you just created. In this step, you install and configure the AWS SDK for Go, which provides a convenient way to interact with AWS services such as Amazon S3, from your Go code. Before you install the AWS SDK for Go, you must set your GOPATH environment variable. After you install the AWS SDK for Go and set your GOPATH environment variable, you must set up credentials management in your environment. The AWS SDK for Go needs these credentials to interact with AWS services. Open your ~/.bashrc file for editing. After the last line in the file, type this code. Source the ~/.bashrc file so that the terminal can now find the GOPATH environment variable you just referenced. Confirm that the GOPATH environment variable is successfully set by running the echo $GOPATH command. If successful, /home/ec2-user/environment/go or /home/ubuntu/environment/go should be output. Run the go get command, specifying the location of the AWS SDK for Go source. Go installs the AWS SDK for Go source into the location specified by your GOPATH environment variable, which is the go folder in your environment. Each time you use the AWS SDK for Go to call an AWS service, you must provide a set of credentials with the call. These credentials determine whether the AWS SDK for Go has the appropriate permissions to make that call. If the credentials don't cover the appropriate permissions, the call will fail. In this step, you store your credentials within the environment. To do this, follow the instructions in Calling AWS Services from an Environment in AWS Cloud9, and then return to this topic. For additional information, see Specifying Credentials in the AWS SDK for Go Developer Guide. In this step, you add some more code, this time to interact with Amazon S3 to create a bucket, list your available buckets, and then delete the bucket you just created. You will run this code later. In the AWS Cloud9 IDE, create a file with this content, and save the file with the name s3.go. For Command, type s3.go YOUR_BUCKET_NAME THE_AWS_REGION , where YOUR_BUCKET_NAME is the name of the bucket you want to create and then delete, and THE_AWS_REGION is the ID of the AWS Region you want to create the bucket in. For example, for the US East (Ohio) Region, use us-east-2. For more IDs, see Amazon Simple Storage Service (Amazon S3) in the Amazon Web Services General Reference. Amazon S3 bucket names must be unique across AWS—not just your AWS account. To prevent ongoing charges to your AWS account after you're done using this sample, you should delete the environment. For instructions, see Deleting an Environment in AWS Cloud9.